This article is about the series. For the video game, see Kingdom Hearts (video game). Kingdom Hearts (Japanese: キングダム ハーツ, Hepburn: Kingudamu Hātsu) is a series of action role-playing games developed and published by Square Enix (originally by Square). It is a collaboration between Disney Interactive and Square Enix, and is under the direction of Tetsuya Nomura, a longtime Square Enix character designer. Kingdom Hearts is a crossover of various Disney properties based in a fictional universe. The series centers on the main character, Sora, and his journey and experiences with various Disney, Square Enix and Pixar characters. The heroes of the series clash against the multiple incarnations of the primary antagonist, Xehanort, throughout the series. The series consists of thirteen games available for multiple platforms, and future titles are planned. Most of the games in the series have been positively received and commercially successful. As of February 2019, the Kingdom Hearts series has shipped more than 30 million copies worldwide. A wide variety of related merchandise has been released along with the games, including soundtracks, figurines, companion books, light novels, cards, and comic series. Kingdom Hearts is the first game in the series, released in Japan on March 28, 2002 for PlayStation 2. Tetsuya Nomura has served as game director, his first time in this position. Kingdom Hearts introduced the main characters (Sora, Kairi and Riku) of the series, and established the plot's framework involving hearts and dark beings known as the Heartless. It also established the role of Disney characters in the series, with character cameos from the Final Fantasy series. Kingdom Hearts was released in North America on September 17, 2002, and featured additional content that was not in the original Japanese version. The game was later re-released in Japan as Kingdom Hearts Final Mix on December 26, 2002. Final Mix includes the content from the North American release and additional enemies, cutscenes, and weapons. Kingdom Hearts: Chain of Memories is a direct sequel to the first game. It was released on the Game Boy Advance in Japan on November 11, 2004. Chain of Memories was touted as a bridge between the two PlayStation 2 titles, introducing and previewing plot elements that would be explored in the next game. The gameplay system is a departure from the original and employs card game mechanics in real time. Players construct decks out of cards that correspond to different actions in battle, such as attacking or using magic. It was remade into a PlayStation 2 game titled Kingdom Hearts Re:Chain of Memories, which contains polygonal graphics instead of the sprites used in the original game. The remake was released in Japan as a second disc packaged with Kingdom Hearts II Final Mix on March 29, 2007, and in North America as a standalone title on December 2, 2008. Kingdom Hearts II takes place one year after the events of Chain of Memories. It was released for the PlayStation 2 in Japan on December 22, 2005. The game further explores the "heart" concept by involving a new group of enemies, the Nobodies, which are the cast-off shells of those who have become Heartless. 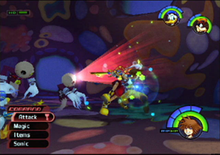 The gameplay is similar to that of the first Kingdom Hearts game, with the addition of the Reaction Command, which performs context-sensitive actions in battle. Kingdom Hearts II was revised into Kingdom Hearts II Final Mix, which contains more material than the original release, such as additional cutscenes and bosses. Kingdom Hearts II Final Mix was released with Kingdom Hearts Re:Chain of Memories in a collection titled Kingdom Hearts II Final Mix+, which was released in Japan on March 29, 2007. Kingdom Hearts Coded is an episodic mobile phone game that picks up directly after Kingdom Hearts II. The "preinstall" episode was released in Japan on November 18, 2008 and eight episodes were released between June 3, 2009 and January 28, 2010. The game was remade for the Nintendo DS as Kingdom Hearts Re:coded, and features updated gameplay combining that of two later titles in the series, 358/2 Days and Birth by Sleep. Unlike the original version, Re:coded was released internationally: October 7, 2010 in Japan; January 11, 2011 in North America; and January 14, 2011 in Europe. Kingdom Hearts 358/2 Days was released for the Nintendo DS in Japan on May 30, 2009. It is primarily set between Kingdom Hearts and Kingdom Hearts II, focusing on Roxas' time in Organization XIII and his motives for leaving. It is the first game in the series to feature cooperative multiplayer in addition to the traditional use of AI-controlled partners. Gameplay is mission-based with optional objectives that yield additional rewards. The game also has a unique panel system which governs character improvement, special abilities, and equipped weapons. Kingdom Hearts Birth by Sleep is a prequel to the series, released for the PlayStation Portable in Japan on January 9, 2010, and in North America on September 7, 2010 with additional content. The game is set ten years before the events of the first Kingdom Hearts game, revealing the origins of the villain, Xehanort. It consists of four scenarios, three of which focus on one of the game's three protagonists, Terra, Ventus and Aqua. The game was re-released in Japan under the title Kingdom Hearts Birth by Sleep Final Mix on January 20, 2011 with the content from the English versions as well as new features, such as an additional fifth scenario. Kingdom Hearts 3D: Dream Drop Distance was released on March 29, 2012 in Japan for the Nintendo 3DS. The game focuses on Sora and Riku's Mark of Mastery exam under Yen Sid in anticipation of Xehanort's return and their subsequent conflicts with enemies from their past. In addition to similar systems inherited from Birth by Sleep, this game features "Dream Eaters" which serve as both enemies and allies. Players may collect and breed friendly Dream Eaters and train them to become more powerful. The English edition came out on July 20, 2012 in Europe while it came out on July 31, 2012 for North America. Kingdom Hearts χ: At Tokyo Game Show 2012, Square Enix announced Kingdom Hearts χ, previously known as Kingdom Hearts for PC Browsers. It is a browser game for PCs, and is only playable in Japan since July 18, 2013. It features cartoon-like 2D models and is a prequel to the series, taking place before the Keyblade War. Kingdom Hearts: Unchained χ: An international port of Kingdom Hearts χ that was released for Android and iOS devices featuring content from the original game's release while later diverging from it and providing all-new content. Unchained χ was released in Japan on September 3, 2015, in North America on April 7, 2016, and in Europe on June 16, 2016. Later in April 2017, it was rebranded as Kingdom Hearts: Union X.
Kingdom Hearts III: In September 2010, Tetsuya Nomura stated that his team was too busy with other projects such as Final Fantasy XV (known as Final Fantasy Versus XIII at the time) to work on Kingdom Hearts III. He also stated that his team was doing research concerning the high-definition graphics of the game, and depending on the technical requirements of the next generation consoles. On June 10, 2013, at the E3 Sony press conference, after years of rumors and speculations, Nomura introduced a teaser for Kingdom Hearts III, which stated it was in development for the PlayStation 4. It was announced the next day to be in development for the Xbox One as well. In Kingdom Hearts III, the series protagonist Sora embarks on a journey to regain his lost "Power of Waking" while Sora's friends, Riku and King Mickey, search for the Keyblade wielders, Aqua, Terra and Ventus in preparations for their final battle against Xehanort. The game concludes in the "Dark Seeker Saga". The game was released on January 25, 2019 in Japan and was released on January 29, 2019 worldwide. A Kingdom Hearts game was developed for V CAST, Verizon Wireless's broadband service, and was released on October 1, 2004 in Japan and on February 4, 2005 in the United States. It was one of the launch games for the V CAST services. The game, developed by Superscape and published by Disney Mobile with no involvement from Square Enix, features gameplay akin to the first Kingdom Hearts game, modified for the input method of mobile phones. The game's storyline features Sora struggling to free himself from a nightmare induced by Maleficent's magic. Kingdom Hearts Mobile is a Kingdom Hearts-themed social game in which players can play mini-games together. Unlike Kingdom Hearts for the V CAST and Kingdom Hearts Coded, this game does not have a storyline and focuses more on socializing. The service operates in conjunction with Kingdom Hearts Coded—new avatar costumes become available after the player completes an episode of Kingdom Hearts Coded. Kingdom Hearts-related media such as wallpapers, ringtones, graphics, and other items can be purchased and downloaded through the service for mobile phones. Kingdom Hearts VR Experience: Announced in September 2018, Kingdom Hearts VR Experience is a free, 10-minute interactive video "featuring iconic moments [and music] from the Kingdom Hearts games" with the ability to unlock additional content by progressing through the experience. The first part was released in Japan on January 23, 2019, with the second part releasing in early 2019. The first part had initially been scheduled to release on January 18, 2019, after initial release dates of December 25, 2018 for the first part, with the second part releasing on January 18, 2019. Kingdom Hearts HD 1.5 Remix was released for the PlayStation 3 in Japan on March 14, 2013. The collection includes remastered versions of Kingdom Hearts Final Mix and Re:Chain of Memories, which include gameplay enhancements and trophy support. In addition, a "Theatre Mode" has been added, consisting of high definition cutscenes from Kingdom Hearts 358/2 Days. The collection was released in North America on September 10, 2013 in Australia on September 12, 2013, and in Europe on September 13, 2013. Kingdom Hearts HD 2.5 Remix: After the announcement of HD 1.5 Remix, Nomura stated that it would be "pretty unnatural" if Kingdom Hearts II did not receive an HD update. In the credits of HD 1.5 Remix, clips of Kingdom Hearts II Final Mix, Kingdom Hearts Birth by Sleep Final Mix and Kingdom Hearts Re:coded were shown, hinting at another collection. On October 14, 2013, the collection was announced for the PlayStation 3, and will include the previously mentioned games, with Re:coded appearing as HD cinematics, similar to 358/2 Days in HD 1.5 Remix. The collection was released in Japan on October 2, 2014, North America on December 2, 2014, Australia on December 4, 2014, and Europe on December 5, 2014. Kingdom Hearts HD 2.8 Final Chapter Prologue: In the credits of HD 2.5 Remix, clips of Kingdom Hearts 3D: Dream Drop Distance were shown as well as the inclusion of a secret ending related to the game, hinting at a possible additional collection. In September 2015, Square Enix announced Kingdom Hearts HD 2.8 Final Chapter Prologue. The collection features an HD remaster of Dream Drop Distance as well as Kingdom Hearts χ Back Cover, a cinematic telling of the backstory behind the events of Kingdom Hearts χ, and Kingdom Hearts 0.2: Birth by Sleep – A Fragmentary Passage, a new game taking place after the events of the original Birth by Sleep, told from the perspective of Aqua. It was released in Japan on January 12, 2017, and in North America and Europe on January 24, 2017. Kingdom Hearts Starter Pack: HD 1.5 + 2.5 Remix: A collector's pack released in Japan includes Kingdom Hearts HD 1.5 Remix and Kingdom Hearts HD 2.5 Remix. Kingdom Hearts Collector's Pack: HD 1.5 + 2.5 Remix: A collector's pack released in Japan includes Kingdom Hearts HD 1.5 Remix and Kingdom Hearts HD 2.5 Remix, a code to get an Anniversary Set for Kingdom Hearts χ, music, and a booklet with art from the series. Kingdom Hearts HD 1.5 + 2.5 Remix: In October 2016, Square-Enix announced a single-disc compilation release of Kingdom Hearts HD 1.5 Remix and Kingdom Hearts HD 2.5 Remix for the PlayStation 4. The compilation was released on March 9, 2017 in Japan; March 28, 2017 in North America; and March 31, 2017 in Europe. Kingdom Hearts: The Story So Far: Announced in early October 2018, this bundle collects the Kingdom Hearts HD 1.5 + 2.5 Remix PlayStation 4 collection and Kingdom Hearts HD 2.8 Final Chapter Prologue. It was released in North America on October 30, 2018 for the PlayStation 4. Though Kingdom Hearts III was the end of the "Dark Seeker Saga" which revolved around Xehanort, it had been decided where certain characters end up in order to potentially continue their stories in future games. Kingdom Hearts features a mixture of familiar Disney and Square Enix characters, as well as several new characters designed and created by Nomura. In addition to original locations, the Kingdom Hearts series features many worlds from Disney films. Sora must visit these worlds and interact with various Disney characters to protect them from enemies. Often, his actions in these worlds closely follow the storylines of their respective Disney films. The main characters try not to interfere with the affairs of other worlds, as it could negatively affect the universe's order. Moogles, small creatures from the Final Fantasy series, are another common element in the games. They provide the player with a synthesis shop in order to create and purchase items used in the game. The main cast from The World Ends with You also makes an appearance in the series in Dream Drop Distance, and Kingdom Hearts III features characters from Pixar films such as Toy Story series and Monsters, Inc.. The series starts with Kingdom Hearts, where a 14-year-old boy named Sora is separated from his friends Riku and Kairi when their home Destiny Islands is consumed in darkness. At that moment Sora obtained a weapon called the Keyblade that allows him to fight the Heartless, creatures that originate from the Realm of Darkness, before ending up in another world, Traverse Town, where he meets Donald Duck and Goofy, two emissaries from Disney Castle sent to find the Keyblade wielder under orders from their missing king, Mickey Mouse. As the three band together and travel to save various worlds from the Heartless while searching for their companions, encounter a group of Disney villains whose ability to control the Heartless was given to them by Maleficent, who enlists Riku's aid in seeking seven maidens called the Princesses of Heart whose power would open the way to Kingdom Hearts, the heart of all worlds. Though eventually defeating Maleficent and reunited with Kairi after sacrificing himself to restore her heart to her body, Sora learns that Maleficent was manipulated by a sentient Heartless who claims himself as the Heartless researcher Ansem and has possessed Riku's body. Though Sora defeats Ansem, his act of sealing the door to the Realm of Darkness trapped Riku and Mickey there as he resolves to find them while Kairi remains at the Destiny Islands for their return. In Kingdom Hearts: Chain of Memories, Sora, Donald and Goofy's search for Riku and Mickey leads them to Castle Oblivion, a fortress controlled by a mysterious group of non-existent "Nobodies" called Organization XIII, the castle's overseer Marluxia using the power of a girl named Naminé to alter the group's memories for his agenda. After defeating Marluxia, the three are put to sleep for a year by Naminé to restore their original memories while losing the memories of their experience in Castle Oblivion. Meanwhile, Riku arrives in the basement of the castle and ascends to the surface with the aid of Mickey. Discovering Sora's sleeping state while joining forces with the mysterious DiZ, Riku helps Naminé keep Sora safe until he is awoken. In Kingdom Hearts 358/2 Days, a snag in the plan over the year forces Riku to capture Roxas—Sora's Nobody and Organization XIII member that came into being when Sora briefly became a Heartless in the first game-after he was forced to defeat and absorb Xion, a Replica of Sora in Kairi's image. In Kingdom Hearts II, after Roxas was integrated back into him, Sora awakens from his sleep as he and his friends resume their search for Riku and King Mickey, the latter's mentor Yen Sid re-familiarizing the trio with the Nobodies and Organization XIII's remaining members whom they deal alongside Maleficent and her right hand Pete. The three reunite with King Mickey and encounter Xemnas, Organization XIII's leader and the Nobody of the Heartless Ansem. The Organization's plan is also revealed: they seek to regain their lost hearts by creating their own version of Kingdom Hearts from the sum of all the hearts released from the Emblem Heartless slain by Keyblade users. Axel, a rogue member of the Organization who is Roxas' friend and first encountered Sora in Castle Oblivion, abducts Kairi in an attempt to see Roxas but ended up giving his former friend Saix leverage to force Sora to finish what Roxas and Xion began. Axel sacrifices himself to help Sora's group reach The World That Never Was (Organization XIII's headquarters) and team up with Riku as they reunite with Kairi. DiZ, revealed to be the real Ansem, attempts to dissipate some of the artificial Kingdom Hearts before being engulfed in an explosion when his extraction device self-destructs and is sent to the Realm of Darkness. Sora and his friends then battle Xemnas. After Sora and Riku defeat Xemnas, they get trapped in the Realm of Darkness, but a letter from Kairi summons a gateway for them, and the two are reunited with their friends at their home. Sometime later, Sora, Riku, and Kairi receive a letter from King Mickey. The letter, written by Mickey during the events of Kingdom Hearts Coded, describes the parts of their past that Naminé learned while restoring Sora's memory. As they read the letter, they learn of Xehanort's true identity as a Keyblade Master who sought the secrets of the Keyblade War which created that current reality and the fates that befall the apprentices of his friend Eraqus during the events of Kingdom Hearts Birth by Sleep: Terra having ended up possessed by Xehanort and made into the original being of Xehanort's Heartless and Xemnas were split from; Ventus sacrificing his heart by fighting his dark counterpart Vanitas while to prevent Xehanort from recreating the legendary χ-blade which allows the user to control Kingdom Hearts and hiding within four-year-old Sora's heart; and new Keyblade Master Aqua getting trapped in the Realm of Darkness during her attempt to save Terra from Xehanort. King Mickey also discovers that the destruction of "Ansem" and Xemnas has led to the restoration of Xehanort. To combat the new threat Xehanort poses, Sora and Riku take an exam to attain the Mark of Mastery that will allow them to become Keyblade Masters themselves. During the test in Kingdom Hearts 3D: Dream Drop Distance, Sora and Riku enter the Realm of Sleep where they encounter a young version of Xehanort who can travel through time. The two Keyblade wielders also learn how Xehanort has long manipulated events since Birth by Sleep with Organization XIII's true purpose in providing thirteens vessels for him to inhabit and use against seven hearts of pure light in an ultimate battle to recreate the χ-blade. Sora is narrowly saved from being Xehanort's final vessel with the aid of Lea (Axel's original self) and Riku learns about data that Ansem the Wise had implanted within Sora during his year-long sleep, which may be used to save those connected to Sora. At the end of the exam, Riku is declared a Keyblade Master; in Kingdom Hearts HD 2.8 Final Chapter Prologue, Sora embarks on another journey to regain his missing power, while Yen Side proceeds to train Kairi and Lea to help the other Keyblade users defend the Princesses of Heart and combat the new Organization XIII. In Kingdom Hearts III, Sora is accompanied by Donald and Goofy and travels the worlds to regain his "Power of Waking" while Riku and Mickey retrace Aqua's steps to find her and Terra. Sora later discovers Eraqus's Keyblade on the beach and uses it to open a door to the Realm of Darkness, finding Aqua who has been consumed by darkness after Ansem was abducted by Xehanort's Heartless. Once Aqua is purified by Sora and Riku, she leads them to Castle Oblivion which she restores to its true form as the Land of Departure to revive Ventus despite Vanitas attempting to stop them. Later joined by Kairi and Lea, the group face Xehanort at the Keyblade Graveyard where they are joined by Roxas as they manage to free Terra and Xion from the Organization's control with only Xehanort remaining once his forces have been defeated. But Xehanort kills Kairi to force Sora to manifest the χ-blade, using the weapon to summon the true Kingdom Hearts and act on his scheme to wipe the slate on reality clean before Sora and his friends finally defeat him. Xehanort departs with Eraqus's spirit into the light as Sora closes Kingdom Hearts, sacrificing himself to revive Kairi. Sometime later, everyone and Naminé celebrate victory at Destiny Islands. But Xigbar (Xehanort's right hand) is revealed to be the current incarnation of the ancient Keyblade Master Luxu from the time of the Keyblade War who proceeds with the next phase of his mission. The Kingdom Hearts games contain elements of action role-playing video games with hack-and-slash elements. The games are driven by a linear progression from one story event to the next, usually shown in the form of a cutscene, though there are numerous side quests available that provide bonus benefits to the characters. In most games, the player primarily controls the principal protagonist of the series, Sora. Sora is usually accompanied by Donald Duck and Goofy, who are artificial intelligence-controlled non-playable characters that aid Sora in battle. In the first and third game, their behavior can be altered to suit different combat objectives. The games feature real-time combat that incorporates physical attacks, magic, and summonings, though each game handles battles differently. The game also allows for items to be used on the field of battle to heal oneself or one's party members. Gummi Ships are another common element of the series, which serve as the main mode of transportation between worlds in the games. The gameplay for the Gummi Ship sections is more akin to a rail shooter. Because it received negative criticism in the first game, it was modified in the third title. Most games also feature a journal which is accessible from the main menu. This journal keeps track of information regarding the story, characters, enemies, and locations. In the first three games, the journal is kept by Jiminy Cricket, who was appointed by Queen Minnie as the royal chronicler. In 358/2 Days, Birth by Sleep and Dream Drop Distance, the main characters write their own journal entries. The games are influenced by their parent franchise, Final Fantasy, and carry its gameplay elements over into their own action-based, hack-and-slash system. Like many traditional role-playing games, Kingdom Hearts features an experience point system which determines character development. As enemies are defeated, the player gains experience which culminates in a "level-up", where the characters grow stronger and gain access to new abilities. The amount of experience is shared with all party members and each character grows stronger as experience is gained. The music for the series has been primarily composed by Yoko Shimomura. Kaoru Wada works as the arranger for orchestral music, including orchestral renditions of the main vocal themes and the ending themes. The orchestral music was performed by the New Japan Philharmonic Orchestra and the Tokyo Philharmonic Orchestra. Soundtracks were released for the first and third installments following the release of their respective games. A compilation soundtrack was later released that included soundtracks for the entire series, including reworked tracks for the re-released Kingdom Hearts Re:Chain of Memories. While the themes for some of the Disney-based worlds are taken directly from their Disney film counterparts, most of them are given entirely original musical scores. In addition to each world having unique background music, each is given its own battle theme rather than having a common theme to cover all fights. Several of the main characters have themes, and the final boss of each game has several themes played in the various phases of those fights. The fights with Sephiroth feature a modified version of Nobuo Uematsu's "One-Winged Angel" from Final Fantasy VII. The main theme songs for the Kingdom Hearts games were written and performed by Japanese pop star, Hikaru Utada. The three main themes are "Hikari", originally from Kingdom Hearts, "Passion", from Kingdom Hearts II, and "Oath" from Kingdom Hearts III. Each song has an English counterpart, "Simple and Clean", "Sanctuary", and "Don't Think Twice" respectively, for the North American and European releases. Utada was the only singer Tetsuya Nomura had in mind for the first Kingdom Hearts theme song. This marked the first time Utada had produced a song for a video game. Both of the first two theme songs reached notable popularity; on weekly Oricon charts, "Hikari" reached No. 1 in 2002 and "Passion" reached No. 4 in 2005. The initial idea for Kingdom Hearts began with a discussion between Shinji Hashimoto and Hironobu Sakaguchi about Super Mario 64. They were planning to make a game with freedom of movement in three dimensions like Super Mario 64 but lamented that only characters as popular as Disney's could rival a Mario game. Tetsuya Nomura, overhearing their conversation, volunteered to lead the project and the two producers agreed to let him direct. A chance meeting between Hashimoto and a Disney executive in an elevator—Square and Disney had previously worked in the same building in Japan—allowed Hashimoto to pitch the idea directly to Disney. Development began in February 2000 with Nomura as director and Hashimoto as producer. While Nomura had done previous work in the Final Fantasy series as monster designer and graphic director, he did not gain widespread recognition until he was the lead character designer for Final Fantasy VII. Kingdom Hearts marked his transition into a directorial position, though he also served as the game's character designer. Scenarios were provided by Kazushige Nojima who was a scenario writer for Square from Final Fantasy VII until he left in 2003. Originally the development focused on the gameplay with a simple story to appeal to Disney's target age range. After Kingdom Hearts executive producer Hironobu Sakaguchi told Nomura the game would be a failure if it did not aim for the same level as the Final Fantasy series, he began to develop the story further. In June 2013, Nomura stated the name of the game came from him thinking about Disney Theme Parks, especially Animal Kingdom. However, Nomura could not get the IP with just "Kingdom", so the development team began to think about "heart" as a core part of the story, so they decided to combine the two to form "Kingdom Hearts". Nomura placed a secret trailer in Kingdom Hearts in hopes that fans would want a sequel. He was unsure if fans would want a sequel and felt that if they did not, then it would be best to leave certain events in the first game unexplained. After Kingdom Hearts Final Mix was completed, development for Kingdom Hearts II began. There were several obstacles to clear before development could begin on a sequel. One was the development team's desire to showcase Mickey Mouse more; Mickey's inclusion in the first game was restricted to a very small role. Nomura had planned for the sequel to take place a year after the first and originally intended for the events of that year to be left unexplained. To bridge the gap between the two games, Kingdom Hearts: Chain of Memories was developed. Nomura was hesitant about releasing a game on the Game Boy Advance because he felt the 3D graphics of the original game would not translate well into 2D. He changed his position after hearing that children wanted to play Kingdom Hearts on the handheld system. Though Disney gave Nomura freedom in the characters and worlds used for the games, he and his staff tried to stay within the established roles of characters and boundaries of the worlds. Nomura has stated that though many of the Disney characters are not normally dark and serious, there were not many challenges making them so for the story, and despite this, their personalities shine because they maintain their own characteristics. He also felt managing and keeping multiple worlds was problematic. When deciding which worlds to include in the game, the development staff tried to take into account worlds with Disney characters that would be interesting and made an effort to minimize any overlap in the overall look and feel of each world. The inclusion of specific Final Fantasy characters was based on the opinions of both fans and staff. Another criterion for inclusion was whether the staff felt the characters would fit into the storyline and in the Kingdom Hearts universe. Initially, Nomura was hesitant to use characters he did not design, because he was unfamiliar with the backstory of such characters. For Kingdom Hearts II, he changed his mind after receiving pressure from his staff. Throughout the development of the games, Nomura has often left certain events and connections between characters unexplained until the release of future games. Nomura does this because he feels that games should have room for fans to speculate and use their imagination. He has stated that with speculation, even though a game gets old, people can still be happy with it. The first Kingdom Hearts was announced at E3 in May 2001. Initial details were that it would be a collaboration between Square and Disney Interactive, and would feature worlds developed by both companies and Disney characters. New characters were designed by Nomura and include Sora, Riku, Kairi, and the Heartless. On May 14, 2002, a press release announced a list of the English voice actors. The list included Haley Joel Osment, David Gallagher, and Hayden Panettiere as the three new characters introduced into the game. It was also announced that many of the Disney characters would be voiced by the official voice actors from their respective Disney films. A secret trailer in the first Kingdom Hearts and Kingdom Hearts Final Mix hinted at the possibility of a sequel. Rumors for a sequel on the PlayStation 2 were spurred in Japan when a Japanese video game site, Quiter, stated that "an internal (and anonymous) source at Square Japan" confirmed that development of Kingdom Hearts II had begun. It was not until Kingdom Hearts II was announced, along with Kingdom Hearts: Chain of Memories, at the Tokyo Game Show in September 2003 that rumors were confirmed. Initial details were that it would take place some time after Kingdom Hearts: Chain of Memories, which takes place directly after the first game. Other details included the return of Sora, Donald, and Goofy, as well as new costumes. At the 2004 Square Enix E3 press conference, the producer, Shinji Hashimoto, stated that many mysteries of the first game would be answered. To help market the games, websites were set up for each game and demos were on display at gaming events. Each game in the main series was also re-released in Japan with additional content and served as canonical updates to the series. The additional content foreshadowed later plot elements in the series. The rereleases of the main series games had the term "Final Mix" added after the title, while Kingdom Hearts: Chain of Memories and Kingdom Hearts Coded were re-released as Kingdom Hearts Re:Chain of Memories and Kingdom Hearts Re:coded and released on the PlayStation 2 and Nintendo DS, respectively, with 3D graphics, voice overs during some cutscenes, and new game content. As of January 24, 2019. The Kingdom Hearts series has been critically and commercially successful. As of March 2014, the series has sold over 20 million copies worldwide. The three main games in the series all met with positive sales at the time of their releases. In the first two months since the North American release of Kingdom Hearts, it was one of the top three highest-selling video games. Chain of Memories sold 104,000 units in 48 hours in Japan, a record for a Game Boy Advance title at the time. Its positive debut sales placed it in the top spot of sales charts in Japan. In the first month of its North American release, it was ranked 1st on GameSpot's ChartSpot for portable systems and 6th for all consoles. Within three days of the Kingdom Hearts II release in Japan, it shipped 1 million copies, selling through within a month. By the end of March 2006, the NPD Group reported that Kingdom Hearts II was the highest-selling console game in North America, with 614,000 copies. In the month after its release in North America, Kingdom Hearts II sold an estimated 1 million copies. As of February 2019, the Kingdom Hearts series has shipped more than 30 million copies worldwide. The games have also received high ratings and positive comments from reviewers. All of the main games in the series have scored a 36 out of 40 or higher from the Japanese gaming magazine Famitsu, known for its harsh grading. All six games have been praised for their visuals. Game Informer considers the series the eleventh "must-play PlayStation 2" series. The individual games have also won several awards. GameSpot commented that the concept of mixing the serious elements of Final Fantasy with the lighter elements of Disney seemed impossible, but was pulled off quite well. Because of that they awarded Kingdom Hearts "Best Crossover Since Capcom vs. SNK" in their 2002 Best and Worst of the Year awards. IGN named Kingdom Hearts "Best Art Style/Direction" in their 2003 list of "Best Looking Games on PS2". G4 awarded it "Best Story" at their 2003 G-Phoria awards show. Electronic Gaming Monthly awarded Kingdom Hearts II "Best Sequel" of 2006. It tied with Resident Evil 4 as Famitsu's Game of the Year 2005. The manga series has also been well received. Several of the manga volumes were listed on USA Today's "Top 150 best sellers". The highest ranked volume was Kingdom Hearts volume 4 at #73. Every volume listed stayed on the list for at least two weeks; Kingdom Hearts volume 4 stayed the longest at four weeks. Both Square Enix and Disney have released a wide variety of Kingdom Hearts merchandise including toys, figurines, clothing, and jewelry. Two of the games, Kingdom Hearts and Kingdom Hearts II, had a soundtrack released to coincide with the video games. These were followed by a nine CD complete set which featured both soundtracks and unreleased tracks. Kingdom Hearts has been adapted as a trading card game by the Tomy corporation of Japan. An English version of the game was released in November 2007 by Fantasy Flight Games. The video games have also been adapted into manga and novel series. Like the Final Fantasy games, a series of "Ultimania" books were released in Japan for many of the games. These books include game walkthroughs, interviews, and extra information from the developers. Kingdom Hearts -Another Report- was released along with Kingdom Hearts II Final Mix+ and features game information, visuals by Shiro Amano, and a director interview. In North America, Brady Games released strategy guides for each game. For Kingdom Hearts II, they released two versions, a standard version and a limited edition version. The limited edition was available in four different covers and included a copy of Jiminy's Journal along with 400 stickers. A manga based on the Kingdom Hearts storyline has been released in Japan and the United States. The story and art are done by Shiro Amano, who is also known for his manga adaptation of the Legend of Mana video game. The story follows the events that took place in the video games with differences to account for the loss of interactivity a video game provides. The manga was originally serialized in Japan by Square Enix's Monthly Shōnen Gangan and eventually released in tankōbon format. The first tankōbon was released in Japan in October 2003. The manga was released in the USA by Tokyopop two years later in October 2005. Yen Press now holds the rights to publish the books for the USA market. The first series, Kingdom Hearts, consists of four volumes, while the second series, Kingdom Hearts: Chain of Memories, has two volumes. The third series, Kingdom Hearts II, has had five volumes published and is on hiatus. A fourth series based on Kingdom Hearts 358/2 Days is being serialized. The games have also been adapted as a light novel series, written by Tomoco Kanemaki and illustrated by Shiro Amano. Like the manga series, it is divided into separate series based on the games. Kingdom Hearts is divided into two volumes; "The First Door" and "Darkness Within". Kingdom Hearts: Chain of Memories is divided into two volumes. Kingdom Hearts II is divided into four volumes; "Roxas—Seven Days", "The Destruction of Hollow Bastion", "Tears of Nobody", and "Anthem—Meet Again/Axel Last Stand". ^ a b c "Kingdom Hearts". IGN. Retrieved September 4, 2007. ^ a b c "Kingdom Hearts Info". GameFAQs. Archived from the original on March 3, 2016. Retrieved May 12, 2007. ^ IGN Staff (September 11, 2002). "Kingdom Hearts Final Mix Images". IGN. Retrieved March 11, 2007. ^ Craig Harris (October 3, 2003). "Kingdom Hearts: Chain of Memories – Square-Enix continues its Disney-based adventure on the GBA. New screens and details". IGN. Retrieved March 11, 2007. ^ "Square Enix Announces Kingdom Hearts Re:Chain of Memories for North America". Square Enix. September 19, 2008. Retrieved September 19, 2008. ^ "Kingdom Hearts: Re:Chain of Memories Heads to Retailers Today". IGN. December 2, 2008. Retrieved December 10, 2008. ^ "Kingdom Hearts II Info". GameFAQs. Archived from the original on March 14, 2016. Retrieved June 14, 2007. ^ "キングダム ハーツ coded" (in Japanese). Square Enix. Archived from the original on April 3, 2016. Retrieved December 19, 2011. ^ "Kingdom Hearts Re:coded Decoded in October". Siliconera. July 19, 2010. Retrieved July 19, 2010. ^ Square Enix Europe (October 6, 2010). "Kingdom Hearts Re:coded is coming to Europe 14 January 2011". Twitter. Retrieved March 30, 2012. ^ Siegel, Scott (September 20, 2007). "TGS07: New Kingdom Hearts games coming to DS, PSP, mobile". Joystiq. Retrieved September 21, 2007. ^ Onyett, Charles (September 19, 2007). "TGS 2007: Three New Kingdom Hearts Titles". IGN. Retrieved September 20, 2007. ^ Kristin Neirinckx (May 17, 2010). "New KINGDOM HEARTS Birth by Sleep PSP Entertainment Pack". PlayStation.Blog. Sony Computer Entertainment. Retrieved May 17, 2010. ^ Anoop Gantayat (June 18, 2010). "Tetsuya Nomura on Kingdom Hearts 3D". Andriasang. Archived from the original on June 19, 2010. Retrieved June 16, 2010. ^ Square-Enix (February 19, 2013). "【PCブラウザ】KINGDOM HEARTSχ[chi]　正式タイトル＆タイトルロゴ決定". Square-Enix. Retrieved February 19, 2013. ^ あなたの手の中に、『KH』の世界が法がる [The world of "KH" expands into your hands]. Famitsu Weekly (in Japanese). Enterbrain (1380): 30–35. May 15, 2015. ^ Romano, Sal (September 1, 2015). "Kingdom Hearts: Unchained Chi launches September 3 in Japan". Gematsu. Archived from the original on September 2, 2015. Retrieved April 4, 2016. ^ "Kingdom Hearts Unchained χ is coming to North America!". Square Enix. April 4, 2016. Archived from the original on April 4, 2016. Retrieved April 4, 2016. ^ Sata (June 15, 2016). "Kingdom Hearts Unchained χ Will Be Available In Europe And In 100 Countries Later Tonight". Siloconera. Retrieved June 15, 2016. ^ Hume, Manon (March 10, 2017). "Kingdom Hearts Union X Cross Update Announced". Game Informer. GameStop. Retrieved March 12, 2017. ^ Electronic Gaming Monthly. September 14, 2010. pp. 12, 13. ^ "Square Enix Announces Next Generation Development of Kingdom Hearts III". Square Enix. June 11, 2013. Retrieved June 11, 2013. ^ Gifford, Kevin (June 19, 2013). "Kingdom Hearts 3 detailed by game director Tetsuya Nomura". Polygon. Retrieved June 19, 2013. ^ Romano, Sal (June 10, 2018). "Kingdom Hearts III launches January 25, 2019 in Japan and Asia, January 29 in North America and Europe". Gematsu. Archived from the original on June 10, 2018. Retrieved June 10, 2018. ^ Wallace, Kimberly (June 10, 2018). "Kingdom Hearts III Finally Gets A Release Date". Game Informer. GameStop. Archived from the original on June 10, 2018. Retrieved June 10, 2018. ^ "Kingdom Hearts". IGN. Retrieved August 8, 2007. ^ Levi Buchanan (February 2, 2005). "V CAST Launches". IGN. Archived from the original on July 1, 2007. Retrieved August 8, 2007. ^ Levi Buchanan (October 20, 2004). "Kingdom Hearts – Disney Mobile presents the future of wireless gaming". IGN. Archived from the original on March 30, 2007. Retrieved March 11, 2007. ^ Radulovic, Petrana (September 10, 2018). "Kingdom Hearts is getting a virtual reality experience". Polygon. Retrieved September 10, 2018. ^ Romano, Sal (January 16, 2019). "Kingdom Hearts: VR Experience delayed to January 23". Gematsu. Retrieved January 16, 2019. ^ a b Graham, Peter (December 21, 2018). "Kingdom Hearts: VR Experience Has Been Delayed by a Month". VR Focus. Retrieved December 27, 2018. ^ Nelva, Giuseppe (December 9, 2018). "Kingdom Hearts: VR Experience for PlayStation VR Gets Release Date and New Screenshots". Twinfinite. Retrieved December 10, 2018. via: "『キングダム ハーツIII』OPテーマ｢Face My Fears｣公開！ OPムービーを使った発表トレーラーをチェック！" (in Japanese). PlayStation Blog Japan. December 10, 2018. Retrieved December 10, 2018. ^ "Kingdom Hearts HD Collection Announced". GameInformer. September 19, 2012. Retrieved September 20, 2012. ^ Kishimoto, Mathew (May 7, 2013). "Kingdom Hearts HD 1.5 ReMIX: Pre-Order for Limited Edition Artbook". Retrieved May 7, 2013. ^ Bruno, Travis (May 10, 2013). "Kingdom Hearts HD 1.5 Remix release date announced for Australia and NZ". Capsule Computers. ^ Bateman, Benjamin (May 7, 2013). "Pre-order Kingdom Hearts HD 1.5 ReMIX, limited edition art book available". Retrieved May 7, 2013. ^ Romano, Sal (October 2, 2012). "Nomura teases Kingdom Hearts II HD". Retrieved April 14, 2013. ^ a b Spencer (June 6, 2014). "Kingdom Hearts HD 2.5 Remix Heads To Japan In October With A Collector's Pack". Siliconera. Retrieved June 6, 2014. ^ Moriarty, Colin (June 5, 2014). "PS3'S Kingdom Hearts HD 2.5 ReMIX Gets A Release Date". IGN. Retrieved June 5, 2014. ^ Wallace, Kimberly (September 15, 2015). "[Update] Kingdom Hearts 2.8 Final Chapter Prologue Revealed For PS4". Game Informer. GameStop. Retrieved September 15, 2015. ^ Romano, Sal (September 13, 2016). "Kingdom Hearts HD 2.8 launches January 12 in Japan". Gematsu. Retrieved September 13, 2016. ^ Romano, Sal (June 23, 2015). "Kingdom Hearts III has mostly new worlds, release window internally decided". Gematsu. Retrieved June 25, 2015. ^ a b c d "Kingdom Hearts Company Line". GameSpot. Archived from the original on May 18, 2007. Retrieved May 13, 2007. ^ Square (November 15, 2002). Kingdom Hearts. PlayStation 2. Square Electronic Arts. Donald: But we can't. If we take him to another world, we would be... / Goofy: Muh... Mudd-- / Donald: Meddling! ^ Kingdom Hearts manga, Volume 1. Page 99. Tokyopop. ^ Frank, Allegra (July 15, 2017). "Kingdom Hearts 3 gets a new trailer and its first Pixar-based world". Polygon. Retrieved July 15, 2017. ^ Wallace, Kimberly (July 16, 2017). "Nomura Shares More Details On Kingdom Hearts III And Its Toy Story World". Game Informer. GameStop. Retrieved July 16, 2017. ^ Pereira, Chris (February 10, 2018). "New Kingdom Hearts 3 Trailer Shows Monsters Inc. World, New Gameplay Details Revealed". GameSpot. Retrieved February 10, 2018. ^ Turner, Benjamin (September 3, 2002). "Kingdom Hearts Review (PS2)". GameSpy. Retrieved July 5, 2007. ^ Square (November 15, 2002). Kingdom Hearts. PlayStation 2. Square Electronic Arts. King Mickey's Note: Donald, Sorry to rush off without sayin' goodbye, nevertheless, there's big trouble brewin'. Not sure why, but the stars have been blinkin' out, one by one. And that means disaster can't be far behind. I hate to leave you all but I've gotta go check into it. There's someone with a "key" — the key to our survival. So I need you and Goofy to find him, and stick with him. Got it? We need that key or we're doomed! So go to Traverse Town and find Leon. He'll point you in the right direction. P.S. Would ya apologize to Minnie for me? Thanks, pal. ^ Dave Zdyrko (February 6, 2002). "Kingdom Hearts Preview". IGN. Retrieved September 5, 2007. ^ "Kingdom Hearts for PlayStation 2 (2002)". MobyGames. Retrieved October 18, 2012. ^ Hollinger, Elizabeth (2004). Kingdom Hearts: Chain of Memories Official Strategy Guide. BradyGames Publishing. ISBN 0-7440-0473-X. OCLC 122414850. ^ Square Enix (December 2, 2008). Kingdom Hearts Re:Chain of Memories. PlayStation 2. Square Enix U.S.A., Buena Vista Games. Jiminy: So you can put 'em back together? / Naminé: Yes, but first I have to undo the chains of memories I made on my own. After I've done that, I have to gather up the memories scattered across each of your hearts and them reconnect them. It might take some time. But I think it might work. No—It will work. I'm sure. It's my turn to look after you. / Sora: All right. We all really trust you. / Jiminy: Oh... Wait just a second! You said you'd have to undo the links you made. But that means— / Naminé: Yes. You won't be able to remember anything about what happened here. / Sora: Not even you? / Naminé: I'm sorry. It's the only way, I'm afraid. ^ Square Enix (March 28, 2006). Kingdom Hearts II. PlayStation 2. Square Enix U.S.A., Buena Vista Games. Mickey: But, what you actually fought was his Heartless. Ya see, he wasn't really Ansem. He just went around telling everybody that he was. ^ Square Enix (March 28, 2006). Kingdom Hearts II. PlayStation 2. Square Enix U.S.A., Buena Vista Games. Mickey: Now I remember! Xehanort! Ansem's apprentice! The leader of Organization XIII is Xehanort's Nobody! ^ Square Enix (March 28, 2006). Kingdom Hearts II. PlayStation 2. Square Enix U.S.A., Buena Vista Games. Ansem the Wise: It's a device to reclaim Kingdom Hearts and encode it as data. / Mickey: Not sure I get it. / Ansem the Wise: I do not claim to know the outcome of this venture, either. After all...Hearts are unpredictable. ^ Square Enix (March 28, 2006). Kingdom Hearts II. PlayStation 2. Square Enix U.S.A., Buena Vista Games. Xemnas: Heed me, Kingdom Hearts! Lend me your power, so that we may be complete! The power to erase the fools that hinder us. ^ Square Enix (March 28, 2006). Kingdom Hearts II. PlayStation 2. Square Enix U.S.A., Buena Vista Games. Sora: W-We're back. / Kairi: You're home. ^ Square Enix, h.a.n.d. (January 11, 2011). Kingdom Hearts Re:coded. Nintendo DS. Square Enix. Data-Naminé: It all began with these memories that were sleeping way down deep in Sora's heart. / Data-Sora: These are my memories? / Data-Naminé: No. Not yours. These belong to people connected to you. [...] When I first found them while repairing your memory, I thought I'd made a mistake. ^ Square Enix 1st Production Department (July 31, 2012). Kingdom Hearts 3D: Dream Drop Distance. Nintendo 3DS. Square Enix. Xehanort: Ah, but destiny is never left to chance. I merely guided them to their proper places. The broken boy who failed to be the blade...the misguided master who sacrificed herself for a friend...and the feckless youth who became my new vessel. ^ Square Enix, h.a.n.d. (January 11, 2011). Kingdom Hearts Re:coded. Nintendo DS. Square Enix. Yen Sid: Mickey, please summon Sora hither. Riku as well. / Mickey: Of course, but...why? / Yen Sid: To show us the Mark of Mastery. ^ Square Enix 1st Production Department (July 31, 2012). Kingdom Hearts 3D: Dream Drop Distance. Nintendo 3DS. Square Enix. Young Xehanort: I am Xehanort from the most distant past. My future self gave me a task—to visit the splintered versions of myself in many worlds, and ensure they gathered here today. ^ Square Enix 1st Production Department (July 31, 2012). Kingdom Hearts 3D: Dream Drop Distance. Nintendo 3DS. Square Enix. Xigbar: Xemnas and Xehanort formed the Organization for a specific reason—round up a bunch of empty husks, hook them up to Kingdom Hearts, then fill them all with the exact same heart and mind. Translation—they were gonna turn all the members into Xehanort. ^ Square Enix 1st Production Department (July 31, 2012). Kingdom Hearts 3D: Dream Drop Distance. Nintendo 3DS. Square Enix. Mickey: Why? How was I so blind? I should've seen it, as soon as Maleficent started gathering the seven princesses of heart. / Xehanort: Yes. They were all my doing. I used the evil fairy to find seven pure lights for me, just as I prepared thirteen vessels to fill with pure darkness. ^ Square Enix 1st Production Department (July 31, 2012). Kingdom Hearts 3D: Dream Drop Distance. Nintendo 3DS. Square Enix. Xehanort: All of the pieces are destined to appear. Your seven lights just like my thirteen darknesses, whose final clash will beget the prize I seek— / Xehanort and Mickey: The χ-blade! ^ Square Enix 1st Production Department (July 31, 2012). Kingdom Hearts 3D: Dream Drop Distance. Nintendo 3DS. Square Enix. Ansem the Wise: Perhaps I wanted to atone for events of the past, even if no apology can undo the harm I have wrought. I felt...that I ought to leave at least something behind. So I digitized myself and my research, and hid them within Sora. /.../ He has touched countless hearts, he has accepted them, and he has saved them. And some of those hearts have never left him—whether they fell into darkness or were trapped there—whether they sleep in the darkness of Sora's heart, or were welcomed into its warmth--they can be saved. All Sora needs to do is be himself and follow wherever it is that his heart takes him. It is the best and the only way. The rest is in there. ^ Square Enix 1st Production Department (July 31, 2012). Kingdom Hearts 3D: Dream Drop Distance. Nintendo 3DS. Square Enix. Yen Sid: I believe we need a new Keyblade Master, one with a new kind of power. Sora and Riku, you both deserve the honor. However, one of you braved the realm of sleep again to unlock the final Keyhole and save a friend. Riku, I name you our new true Keyblade Master. ^ Square Enix 1st Production Department (July 31, 2012). Kingdom Hearts 3D: Dream Drop Distance. Nintendo 3DS. Square Enix. Yen Sid: [Even] if we deliberately avoid finding our seven lights to avert another Keyblade War, Xehanort will still target the seven princesses in order to forge the χ-blade. [...] To protect the seven pure hearts, we will need seven lights strong enough to stand against the thirteen darknesses. ^ "1UP – E3 2005 Interview". Kingdom Hearts Ultimania. Archived from the original on August 8, 2007. Retrieved August 31, 2007. ^ Minnie: Oh, and to chronicle your travels, he will accompany you. / Jiminy: Over here! Cricket’s the name. Jiminy Cricket, at your service. Square (November 15, 2002). Kingdom Hearts. PlayStation 2. Square Electronic Arts. ^ Square (2002). Kingdom Hearts Instruction Booklet. Square. ^ Greg Kasavin (September 9, 2002). "Kingdom Hearts for PlayStation 2 Review". GameSpot. Archived from the original on May 2, 2007. Retrieved May 13, 2007. ^ a b c Kingdom Hearts II Original Soundtrack CD insert. Toshiba-Emi Limited. 2006. ^ a b "Game Music / Kingdom Hearts Original Soundtrack Complete". CD Japan. Retrieved May 16, 2007. ^ a b "キングダムハーツサントラコンプリートBoxとKH2FM+を買ったよ!レポ" (in Japanese). Intermezzo. March 30, 2007. Retrieved July 16, 2007. ^ Hirohiko Niizumi (July 29, 2005). "Kingdom Hearts vocalist returns for sequel". GameSpot. Archived from the original on May 23, 2009. Retrieved June 15, 2007. ^ Stephen Coleman (August 22, 2002). "Square, Disney and Japanese Pop Star Utada Hikaru Collaborate on Kingdom Hearts". IGN. Archived from the original on February 12, 2012. Retrieved May 13, 2007. ^ "CDTV PowerWeb! : 宇多田ヒカル – 光". Tokyo Broadcasting System. Archived from the original on March 30, 2010. Retrieved June 26, 2007. ^ "CDTV PowerWeb! : 宇多田ヒカル – Passion". Tokyo Broadcasting System. Archived from the original on March 30, 2010. Retrieved June 26, 2007. ^ a b "Iwata Asks". Iwataasks.nintendo.com. Retrieved March 4, 2013. ^ "Kingdom Hearts キングダム ハーツ" (in Japanese). Final Fantasy 2000. Retrieved May 30, 2007. ^ a b c "KHU Interview w/Tetsuya Nomura". Kingdom Hearts Insider. Archived from the original on January 25, 2012. Retrieved August 10, 2007. ^ Square Enix (June 25, 2013). Square Enix Presents E3 2013 – Day1 [#03] – KINGDOM HEARTS HD 1.5 ReMIX Interview. Youtube. Retrieved June 28, 2013. ^ a b c "Kingdom Hearts II Ultimania – Tetsuya Nomura Interview". Kingdom Hearts Ultimania. Archived from the original on July 10, 2007. Retrieved August 10, 2007. ^ GameSpot staff (October 10, 2003). "Kingdom Hearts II's Tetsuya Nomura Q & A". GameSpot. Archived from the original on May 25, 2011. Retrieved June 15, 2007. ^ Raymond Padilla (December 8, 2004). "Kingdom Hearts: Chain of Memories Review". GameSpy. Archived from the original on November 7, 2012. Retrieved May 23, 2007. ^ "Kingdom Hearts II's Tetsuya Nomura Q & A". GameSpot. Archived from the original on April 18, 2009. Retrieved June 8, 2007. ^ "Nomura Interview TechTv". Kingdom Hearts Ultimania. Archived from the original on June 9, 2007. Retrieved July 18, 2007. ^ "Playstation.com Europe – E3 Interview". Kingdom Hearts Ultimania. Archived from the original on April 18, 2007. Retrieved September 20, 2007. ^ "IGN – Nomura Interview". Kingdom Hearts Ultimania. Archived from the original on June 8, 2007. Retrieved August 2, 2007. ^ "Kingdom Hearts II Tetsuya Nomura interview". Video Game Blogger. Retrieved July 21, 2007. ^ a b Boulette, Bryan (November 27, 2005). "Nomura Divulges Kingdom Hearts II Details". RPGamer. Archived from the original on August 14, 2012. Retrieved July 23, 2007. ^ "Tetsuya Nomura 1st 1UP Interview". Kingdom Hearts Ultimania. Archived from the original on June 10, 2007. Retrieved September 20, 2007. ^ "Dengeki – Kingdom Hearts 2 Progress Report". Kingdom Hearts Ultimania. Archived from the original on June 8, 2007. Retrieved July 27, 2007. ^ Gerstmann, Jeff (May 17, 2001). "E3 2001: Square announces Disney RPG for PS2". GameSpot. Archived from the original on June 28, 2011. Retrieved January 23, 2008. ^ IGN Staff. "IGN: Kingdom Hearts Voice Cast". IGN. Retrieved May 13, 2007. ^ IGN staff (March 7, 2003). "Kingdom Hearts 2 on PS2?". IGN. Retrieved June 14, 2007. ^ Justin Calvert (September 26, 2003). "TGS 2003: Kingdom Hearts sequels announced". GameSpot. Archived from the original on May 18, 2009. Retrieved June 8, 2007. ^ Benson, Mike (May 12, 2004). "Square Enix E3 Press Conference and "Dear Friends" Concert". Gaming Age. Archived from the original on February 1, 2012. Retrieved September 25, 2007. ^ "「キングダム ハーツII ファイナル ミックス」に新要素が!!" (in Japanese). Famitsu. March 24, 2007. Retrieved July 6, 2007. ^ "Kingdom Hearts II Final Mix". IGN. Retrieved June 21, 2007. ^ "Kingdom Hearts II Final Mix+ (Limited Package Version)". Play-Asia. Retrieved June 21, 2007. ^ "Kingdom Hearts Reviews". Metacritic. Retrieved August 6, 2012. ^ a b "News: November 3, 2004". The Magic Box. Archived from the original on March 13, 2007. Retrieved May 23, 2007. ^ "Kingdom Hearts: Chain of Memories Reviews". Metacritic. Retrieved August 6, 2012. ^ a b Josh Freund (December 20, 2005). "News – Latest Famitsu review scores – Kingdom Hearts II, Mario & Luigi 2, & more". Gamesarefun.com. Archived from the original on July 9, 2011. Retrieved December 15, 2006. ^ "Kingdom Hearts II Reviews". Metacritic. Retrieved August 6, 2012. ^ "Kingdom Hearts Re:Chain of Memories Reviews". Metacritic. Retrieved August 6, 2012. ^ "Famitsu review scores – First Kingdom Hearts 358/2 Days score". NintendoEverything. May 19, 2009. Archived from the original on May 23, 2009. Retrieved January 16, 2010. ^ "Kingdom Hearts 358/2 Days Reviews". Metacritic. Retrieved August 6, 2012. ^ Famitsu Staff (January 21, 2010). "Introduction of Kingdom Hearts: Birth by Sleep". Weekly Famitsu (in Japanese). Enterbrain: 47. ^ "Kingdom Hearts Birth by Sleep Reviews". Metacritic. Retrieved August 6, 2012. ^ "Kingdom Hearts Re:coded Reviews". Metacritic. Retrieved August 6, 2012. ^ "Kingdom Hearts, Baseball with Normal Sized Heads Get 10s in Famitsu". Adriasang. March 21, 2012. Retrieved April 4, 2012. ^ "Kingdom Hearts 3D: Dream Drop Distance Reviews". Metacritic. Retrieved August 6, 2012. ^ "Kingdom Hearts HD 1.5 Remix Reviews". Metacritic. Retrieved August 6, 2012. ^ "Kingdom Hearts HD 2.5 Remix Reviews". Metacritic. Retrieved August 6, 2012. ^ "Kingdom Hearts Unchained χ Reviews". Metacritic. Retrieved August 6, 2012. ^ "Kingdom Hearts HD 2.8 Final Chapter Prologue Reviews". Metacritic. Retrieved January 31, 2017. ^ "Kingdom Hearts HD 1.5 + 2.5 Remix Reviews". Metacritic. Retrieved April 12, 2017. ^ "Kingdom Hearts III Reviews". Metacritic. Retrieved January 24, 2019. ^ Romano, Sal (February 5, 2019). "Famitsu Review Scores: Issue 1575". Gematsu. Retrieved February 10, 2019. ^ "Businesses – Square Enix Holdings". March 31, 2014. Archived from the original on March 25, 2012. Retrieved August 18, 2014. ^ Calvert, Justin (November 18, 2002). "October video game sales". GameSpot. Archived from the original on June 28, 2011. Retrieved July 5, 2007. ^ "News: November 13, 2004". The Magic Box. Archived from the original on March 13, 2007. Retrieved May 23, 2007. ^ GamePro Staff. "Kingdom Hearts for GBA Debuts Number One in Japan". GamePro. Archived from the original on January 13, 2009. Retrieved September 30, 2008. ^ Tor Thorsen (January 31, 2005). "ChartSpot: December 2004". GameSpot. Archived from the original on September 30, 2007. Retrieved June 8, 2007. ^ "Kingdom Hearts II Achieves Million-Unit Sales Mark in North America in Four Weeks". Square Enix. May 2, 2006. Retrieved August 25, 2007. ^ Anoop Gantayat (December 27, 2005). "Kingdom Hearts 2 Goes Platinum". IGN. Retrieved June 14, 2007. ^ Tor Thorsen. "ChartSpot: March 2006". GameSpot. Archived from the original on May 19, 2014. Retrieved May 15, 2007. ^ "TGS06: Kingdom Hearts II Achieves Million-Unit Sales Mark in North America in Four Weeks". Square Enix. Retrieved December 15, 2006. ^ KK. "Highest Scoring Games in Famitsu's History". Zelda-fans.com. Archived from the original on January 25, 2012. Retrieved July 11, 2007. ^ Reiner, Andrew (September 29, 2008). "Top 25 PlayStation 2 Games: The Games That Defined a Generation". Game Informer. Archived from the original on October 7, 2008. Retrieved March 23, 2012. ^ "GameSpot's Best and Worst of 2002". GameSpot. 2002. Archived from the original on July 13, 2007. Retrieved May 13, 2007. ^ IGN Staff (July 31, 2003). "G-Phoria Report". IGN. Retrieved August 7, 2007. ^ EGM Staff (March 2007). "The 2006 1UP Network Awards". Electronic Gaming Monthly (213). pp. 76–81. ^ "Famitsu Awards 2005"大賞は「キングダムハーツII」と「バイオハザード4」!!" (in Japanese). Famitsu. Retrieved December 15, 2006. ^ "USA Today Best-Selling Books Database – Top 150 best sellers". USA Today. Archived from the original on March 23, 2012. Retrieved May 17, 2007. ^ a b "USA Today Best-Selling Books Database – Top 150 best sellers". USA Today. Archived from the original on March 23, 2012. Retrieved June 7, 2007. ^ "USA Today Best-Selling Books Database – Top 150 best sellers". USA Today. Archived from the original on July 6, 2009. Retrieved May 24, 2007. ^ "Official Kingdom Hearts Website: News". Square Enix. Archived from the original on February 15, 2012. Retrieved May 14, 2007. ^ "Square Enix Official Goods – Kingdom Hearts". Square Enix. Archived from the original on August 26, 2007. Retrieved August 27, 2007. ^ "Kingdom Hearts: Original Soundtrack". CD Japan. Retrieved August 8, 2007. ^ "Kingdom Hearts II – Original Soundtrack". CD Japan. Retrieved August 8, 2007. ^ Chris Cook (September 24, 2004). "TGS 2004: Square Enix Press Conference Wrap Up". Game Informer. Archived from the original on June 9, 2007. Retrieved June 22, 2007. ^ "Fantasy Flight Games to publish "Kingdom Hearts TCG"". Fantasy Flight Games. Archived from the original on August 17, 2007. Retrieved October 4, 2007. ^ "ビジュアルブック「キングダム ハーツ -Another Report-」が予約特典!" (in Japanese). Famitsu. January 25, 2007. Retrieved July 6, 2007. ^ "The Key to Unlimited Adventures Lies Within Bradygames' Latest Collectible Kingdom Hearts II Strategy Guide Products". Brady Games. April 6, 2006. Retrieved July 6, 2007. ^ キングダムハーツ (1) (コミック) (in Japanese). ISBN 4757716575. ^ Kingdom Hearts, Vol. 1 (Paperback). Tokyopop. October 2005. ISBN 1598162179. ^ Kingdom Hearts: The First Door – #1 (Kingdom Hearts) (Paperback). ISBN 1423103955. ^ Kingdom Hearts: Darkness Within – #2 (Kingdom Hearts) (Paperback). ISBN 1423103963. ^ Game Novels キングダム ハーツII Vol.1 Roxas-Sevendays (単行本) (in Japanese). ISBN 4757516797. ^ Game Novels キングダム ハーツII Vol.2 The Destruction of Hollow Bastion (新書) (in Japanese). ISBN 4757517157. ^ Game Novels キングダム ハーツII Vol.3 Tears ofNobody (新書) (in Japanese). ISBN 4757517920. ^ Game Novels キングダム ハーツII Vol.4 Anthem-Meet Again/Axel Last Stand (単行本) (in Japanese). ISBN 4757519648. Wikimedia Commons has media related to Kingdom Hearts.